Last week I was doing the dishes and talking on the phone, not watching my kids like a hawk like I should've been doing. 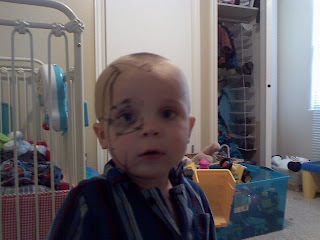 And Lezlee came running into the kitchen and said, "Winkie got a marker!! Quick! Come on Mom!!" So of course I ran. Luckily he only covered the right half of his face and not anything else in the house. But it was done with a big, black magic marker. This was not a Crayola job! Thankfully the people at Huggies know how to make rockstar wipeups! It took it right off. Except around his eye, I couldn't wipe that area as aggressively as the rest of his head! So he kind of looked like he had a blackish eye for a week! Just a side note..... Lezlee's "L's" sound like "W's" and so when she says Linc's name it sounds like "Winkie" instead of "Linkie." Lets hope that nickname doesn't stick! oh my - i had forgotten about this incident. to be honest when i got the pic on my phone, i didnt think it was going to come off easily. so so glad it did. I just have to laugh when I see this Rach. I'm just glad that your warden caught him before he got to the walls!